The 17th edition in a series of posts that highlight one Expert Author who has achieved success by doing just one thing exceptionally well. 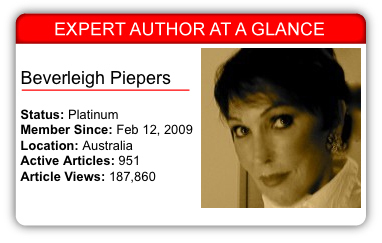 Beverleigh Piepers likens the process of writing and submitting articles to talking to people. They’re both a means of communication to make real connections and explain to people the “real deal” about issues, except articles have the scale to reach people worldwide. Beverleigh has a desire to have a real impact with readers that could save their lives. This desire has motivated her to write many articles on living with diabetes and treatment options. If that wasn’t motivation enough, Beverleigh has also accepted and completed several writing challenges, including #HAHD. She gets her article ideas from a variety of sources. “I listen to people, see what it is that they’re confused about, what questions they’re asking, maybe I hear of something relevant in the news. If one diabetic wants an answer so will thousands of others,” she says. Although a lot of her own experiences have helped give her one-of-a-kind insights into certain topics, she makes an effort to stay committed to writing on a wide range of topics. “[My writing is about] giving my readers what interests them, what affects their lives … not just what interests me,” she says. The thought of her knowledge and insights spreading to an ever-growing audience, and making a real difference for them, makes writing articles very special for Beverleigh. That is, so long as she has fresh, high-quality article ideas to move her writing forward. Beverleigh passed along these (7) tips to help you move your writing forward. Don’t Limit Yourself in Your Learning – Every day, try to learn at least one new thing about your niche. That knowledge really accumulates over time; whether it be over a month, 3 months, a year or more. Make a Schedule – Start by trying to write just one article a day. Over time, it’ll become so natural that you’ll have withdrawal symptoms if you miss out on just one day. Be Open to Sharing – When you keep the lines of communication open with your readers, you have a chance to communicate with a very diverse group of people. We all develop questions and your wisdom can help so many people answer those questions. Take One Step at a Time – You may want to learn everything you need to know to be successful in article writing and marketing in a very short time, but there’s a lot to absorb. Just take the process one step at a time and have fun doing it. Don’t feel intimidated by the people around you if it seems like they know a lot about article writing. Make a Real Impact – Write about things that you are already passionate about. It’ll make coming up with new article ideas and interacting with your audience a whole lot easier. Stay Relaxed – Don’t get stressed about coming up with new article ideas. Put down your thoughts on paper whenever they come to you. Then, take those thoughts and turn them into full-scale articles. Be Conscious of Your Audience – It may not be obvious to readers why your information matters to them. Make it clear in your writing exactly how your article can help them. Take these tips and use them to move your own article writing and marketing campaign forward. Also, leave a comment for Beverleigh. She’d love to hear from you. thank you so much for this. I am new to article writing and I liked your 7 points. You have really inspired me. We had our first baby almost 3 weeks ago, and now he’s more settled I’d like to write more. I will be coming back to these tips to re-read them. really clear, and great at instilling confidence ina newbie. Thank you. Congratulations … your baby must be very content to have settled to quickly. Having worked with many new mothers and their babies, it doesn’t always go that way. You can do it … I remember when I first started writing articles I would sometimes chicken out. But then confidence grew, until now my day is not complete unless I have submitted some articles. It’s really just another way of talking with people … and being a little organized. How are you … thank you for your comment. Being organized definitely helps … that plus a desire to help others. Hi, Beverleigh. Good to read your tips here, as I’m desiring to write an article a day related to my interests in (and passion about) body-mind-spirit holistic healing! One day, you might be interested in having a look at my work — to help people move thru transitions in a relaxed manner, esply. the final one! There’s quite a bit of info on my website; and my first book is also out and available thru Finch Publishing in Australia (The Last Adventure of Life: Inspiring Approaches to Living and Dying is the title, I believe). Who knows? You might find some inspiration for another one of your articles?!? Congratulations on having your first book published. Yes, I would like to look at your work. Helping dying people die with dignity is an honor and a privilege, one I have been involved in many times. Writing articles is just like talking with people … something I think you do very well. The biggest challenge (especially for dads and hubbies like me) is to find the time to write. And when you do find the time to write, the question is whether you have conducive surroundings and the energy to write after already having put in a long day at work. One idea I want to try out myself is: write 8-10 articles but do not submit them. Have a stock of articles ready and then submit them one after the other. This makes you feel as if you have enough material that is good to go and you are ahead of the schedule! Also, weekends are good times, I guess, to build this stock of articles. My pleasure is on reading articles by others and accumulate a lot. I think I have traveled a lot since I began my journey. For me it is a difficult task to write one article per day with reasonable contents giving material value for its readers. Yes, I enjoy reading other peoples articles also … everyone has something to offer and different views help us also. Mostly I do more than one article a day, the important thing here is to just keep doing. Just as you are. Thanks Beverleigh for your response. Reading is one way we acquire ideas. Congratulation oo achieving your expect status and great advise for new marketers like ourselve.I am still learning the ropes on writing and submitting great article content to help me with my marketing effort. I myself i found article marketing is the only free marketing strategy that provide me with targeted Traffic to my site and important and very useful links. My only challenge is write about the topic as halfway down the line my creative juice just get dry out.